September is right around the corner so you know what that means all you September babies! Sapphire! 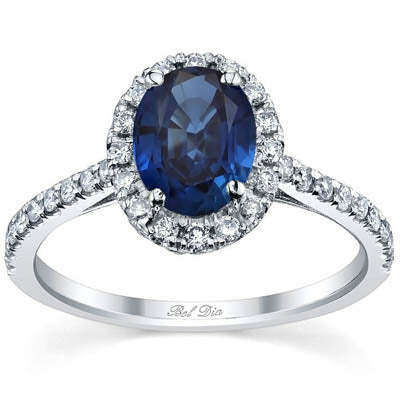 Yes, blue sapphire is the official birthstone for the month of September. Here at deBebians we have lots of sapphire jewelry that is perfect for anyone on your list with a September birthday. Here are a few of my personal favorites. Some are on the site while others are custom creations. This gorgeous oval blue sapphire diamond halo ring is available with three different center sapphire carat weight options. The main photo shows an approximate 1 ct oval while the inset image shows the 3 carat option. If you are shopping for someone with a sapphire birthday, this could be the perfect gift for them! Our station necklaces are available in a variety of options. 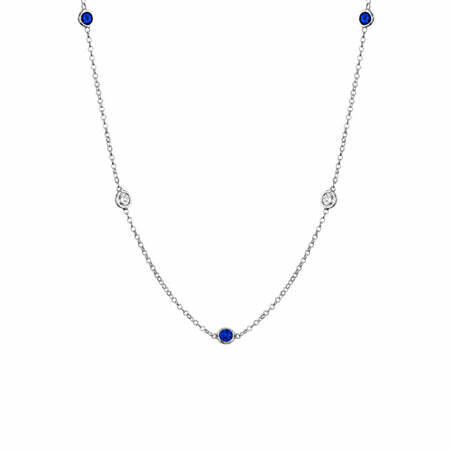 This particular necklace features 7 total stones (three sapphires and four white diamonds) totaling 1.00cttw. Currently priced at $1315, this is a great price point piece for that special person on your list. This is a necklace that can be worn every day, both day and night. This fabulous custom designed blue sapphire and diamond ring was quite a hit with our client. 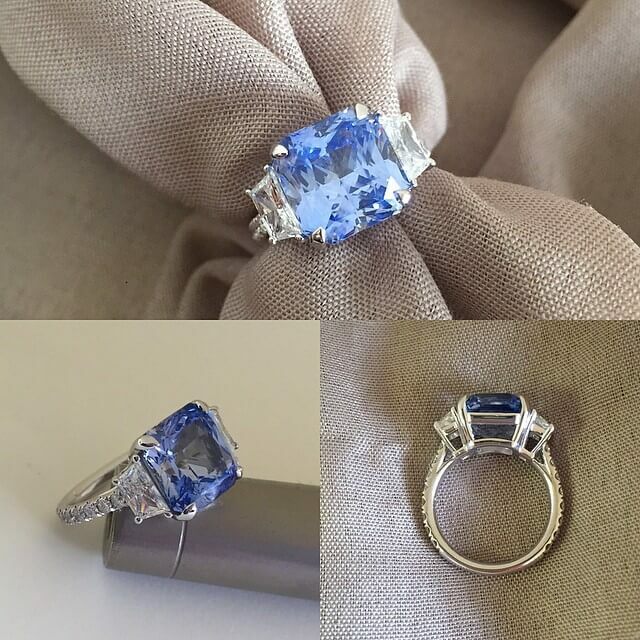 We sourced this 6.24ct Ceylon light blue radiant cut sapphire specifically per our client’s request. It’s set between a pair of brilliant cut trapezoid diamonds and is further accented with U pave set round brilliant cut diamonds. Ok, maybe at nearly $12,000 this isn’t for just anyone on your list. However, if you are looking for an engagement ring and she happens to have a September birthday or even if you are looking for a September anniversary gift, this could be that perfect, over-the-top gift that will surely knock her socks off! Consider yourself lucky if you have a September birthday! Sapphire jewelry is quite beautiful. I have blogged before about the gorgeous contrast of white diamonds next to blue sapphires. Such a fabulous combination! If you need help with selecting that perfect piece of sapphire jewelry, do not hesitate to call on us! We are here to help! Happy shopping!